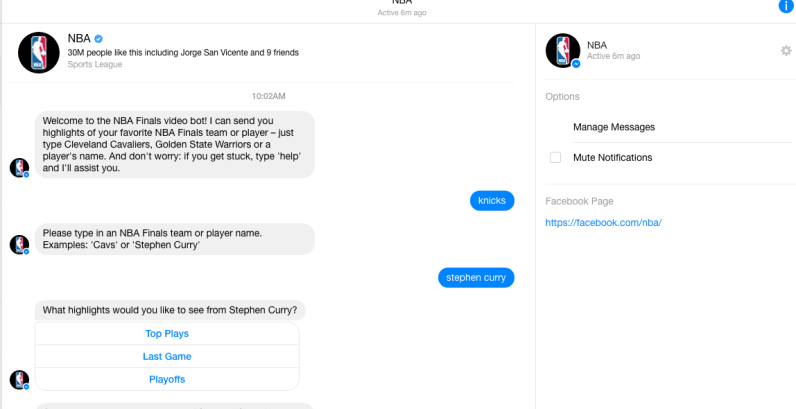 To get you all psyched up for this year’s finals, the NBA just launched a Facebook Messenger chatbot that offers basketball aficionados an easy and convenient way to watch on-demand highlights of their favorite team or player. For now, the NBA bot will have only a limited capacity to show you highlights and will not provide videos of teams and players outside of the 2016 Finals. This means that you’ll have to settle for highlights exclusively from Golden State Warriors and Cleveland Cavaliers. To access highlights, simply open the NBA bot and type the name of a team or a player. The bot, then, will ask you to select between highlights from ‘Top Plays’ (of the season), the ‘Last Game’ or simply the ‘Playoffs’. Once you’ve made your choice, the bot will compile the highlights and drop a link to the video. What’s particularly thoughtful is that after it shares highlights, the bot will automatically ask whether you’d like to continuously receive highlight reels from the team or player you’ve just seen. It is not yet clear whether the NBA bot will be available for a broader list of players and teams in the future, but this wouldn’t be a far-fetched prediction given the growing popularity of bots. Facebook launched its chatbot platform back in April shortly after Skype and Kik introduced their own dev tools for bots earlier in 2016. It will be interesting to see whether other sports organisations will follow the NBA and build their own highlight bots – I, for one, would be excited to see this happen.